If the prior instructable was simple, this is even more so. However I wanted to offer it too because I think it will be useful to many. Some may say it's an accomplishment almost trivial, but since I was very useful, the audience willingly accepting some comment. The we can compare to my previous instructable: "where is my pencil" or, under the appearance of simplicity, my other instructable: "a little help for my friend the painter". How many times, or friends makers-geeks will happen over the course of your work by having to use the scissors and not find it? To me it happens very often: when I am doing my hobbyes, I try and I can not find my scissors that I used until 10 minutes before. I do not deny that this is due to my proverbial confusion in work, (I have the flaw of doing one thing thinking about one other thing I'll have to do later) but the fact is that after several times it was more the range I thought I solved my own problem in a way a bit drastic that pesticide quantities, thus: "a man: scissors "— where I am there's also my scissors. It will also be trivial as solution, not deny it. But it is effective without question. Obviously for me to stay "on" the scissors I found the simplest place to say .... my Pocket! But in order to fit the Pocket without anger my wife (for broken pockets) must have a protection. I thought so to use a very small DIY sheath made from a piece of bicycle air Chamber (and here is the found ...). I took a piece of inner tube of a bicycle length of about 10 cm and with a drop of Cyanoacrylate glue I closed the inner part of this halfway. 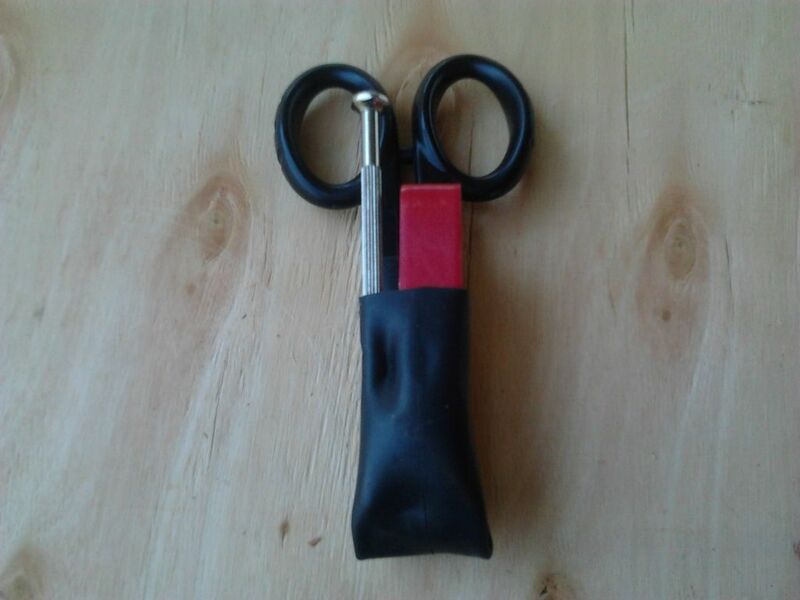 I have thus created two pockets: the first is for the scissors; the second I used instead for two useful accessories and a small screwdriver and duct tape. To fit them permanently I created, always with Cyanoacrylate glue, two smaller pockets for two accessories. I do not I had on hand, but it is clear that the best screwdriver is the classic "Tester". The game is done: I added the three objects of minimal kit from electrician in the appropriate log rafts and. ..
.... as an additional accessory I added a pair of pliers (which is always useful) and I then added a further Pocket is glued to the first two, though, I have to say, I prefer the more "light" version. And everything; I do not want to comment further because I do not think the case! I thank all those who have been following me and I hope that I have helped someone solve a little problem. See you on these pages ... .. .from torx "yeaaa.."